1.5 Million bicycles are stolen in the USA every year! With embedded GPS this prevents theft by simply activating the app on your cell phone to report it stolen to the police. The pedal powers the GPS inside while a solar strip laminated on the frame acts as a reserve energy source. This patent covers a range of industries including snowboarding/skis. A snowboarder might go to the back country in search of fresh snow/powder. He/she might get lost in a blizzard...with embedded gps you can track your loved one and report them missing to ski patrol to be rescued! How can you put a price on saving a life? If it even works once my mission to develop this patent was a huge success! Water sports equipment such as surf boards and stand-up-paddle boards also apply. Firearms are frequently stolen and crimes committed fall liable on the owners. Again, with embedded GPS and the signature label of "Semper Fi Tracking LLC" sticker on the product theft will be deterred and lives will be saved! 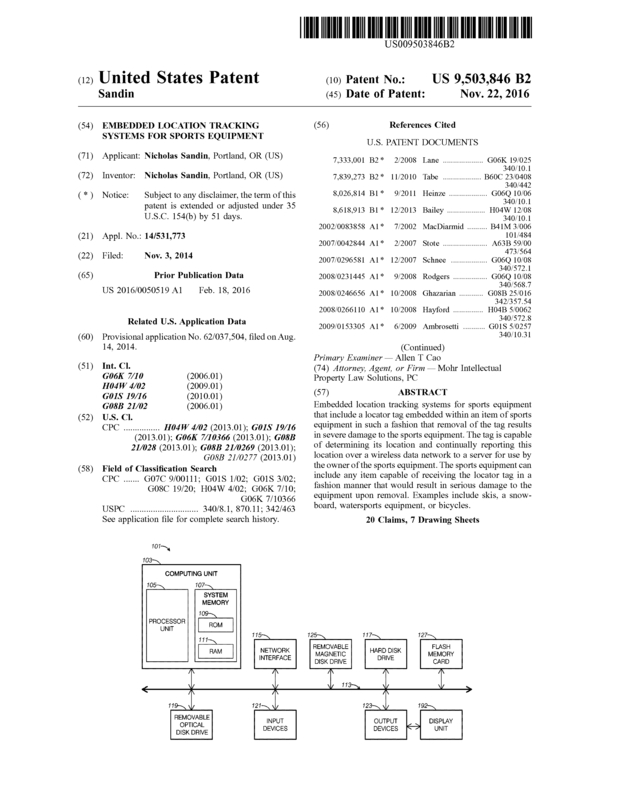 Page created at 2019-04-25 14:43:21, Patent Auction Time.